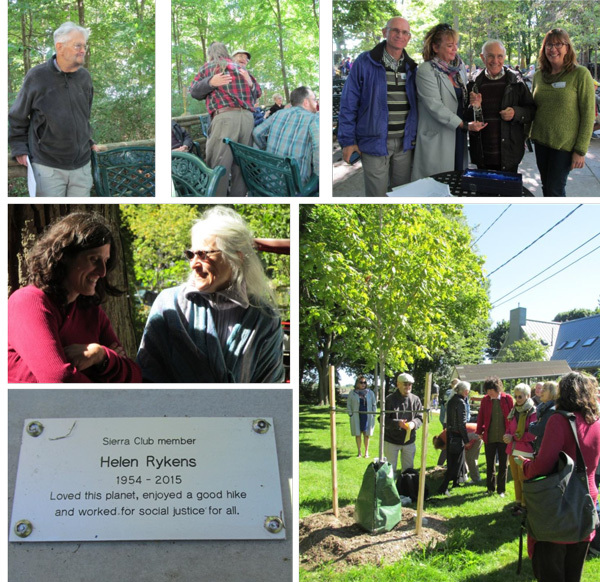 This past weekend, the Ontario Chapter hosted a lovely event on Ward Island (a quick ferry ride from downtown Toronto) to celebrate the legacy of Dan McDermott, who has spent 18 years working for Sierra Club and 40 years in the environmental movement. The event was a moving tribute to Dan's accomplishments, which are many, but include safeguarding The Greater Golden Horseshoe Greenbelt, fighting for the shut-down of nuclear power plants, and organizing Toronto's Car Free Day. Dan is a brilliant strategist and volunteers, interns, and coworkers present at the event told stories of how he inspired them to make change, take on new tasks, and push the envelope. "He has an unlimited ability to think up ideas, and then think of problems with those ideas ( because there always are problems!) and then think up ideas to prepare for those problems," one volunteer noted. Another said, "Dan made us better than we thought we could be." Although cynical, even curmudgeonly, about the political motivation behind many of our environmental problems, it's clear that Dan is at heart an optimist: - otherwise how could he have fought so hard for so long, and inspired others to use their unique talents to do the same? At the same event, Dr. Lino Grima, Co-Chair of the Bi-National Great Lakes Committee, was presented with the Raymond J. Sherman International Award honouring volunteer service for international conservation. The award recognizes his work protecting the Great Lakes from multiple threats, including human-caused changes in water levels, invasive species, and pollution. The work of the binational committee is an outstanding example of how we can work across borders to protect shared ecosystems. I was fortunate to be at the Sierra Club Gala in Oakland, California when the co-recipient of this award, Wayne Howard, Lino's co-chair of the Binational Great Lakes Committee, received his award. Turns out, of course, the formation of the Bi-National Great Lakes Committee was also a brainchild of Dan McDermott! The celebration on Ward's Island closed with a tribute to Dan's late wife, Helen. who died last year. We walked to the sugar maple tree that has been planted on Ward' s Island as a lasting tribute to her, and shared with Dan in honouring her memory. It was clear to me that the love Dan and Helen shared, and the way they nurtured this love even while living the lives of dedicated changemakers, inspired Dan's work and made it even stronger and more fruitful. Dan shared that during the tough times they faced recently he wondered if he should, perhaps, have pursued a career with greater financial benefits than the non-profit sector provides - to which Helen took him by the shoulders, looked him in the eyes and said " Yes, Dan, you could have done that. But then you would not have had me." Dan's challenge to us, issued in his usual straight-shooting way, was to continue his work, and to protect his legacy. Specifically, he called on us to grow the Club through increasing our capacity to fight the battles we need to win and to reassert ourselves on the national stage. This is a project he and all of us can commit to in the years ahead. Dan, we are so lucky to have you.